Celebrities are posting on social media to pay their respects to the late great Burt Reynolds, who passed away earlier today at the age of 82. Reynolds, known for his work in films such as Boogie Nights, Deliverance, and Smokey and the Bandit, is being celebrated on social media by thousands of fans, many referring to the late actor as a "trailblazer." Arnold Schwarzenegger, Reba McEntire, Kevin Smith, Elijah Wood, and more have shared their thoughts on Reynolds. Arnold Schwarzenegger called Burt Reynolds a "hero" of his and noted that it was his inspiration that led him to go from being an athlete to one of the world's highest paid actors. Schwarzenegger also said that Reynolds had a great sense of humor, which has been echoed by nearly everybody that ever worked with him. Reba McEntire, who worked with Reynolds in the made-for-TV movie The Man From Left Field, also mourned the actor. She had this to say. "My good friend has started a new journey. Rest in my peace my friend. I'll never forget the wonderful times we spent together." Comedian Patton Oswalt also took time out of his day to remember Burt Reynolds, offering a funny story about the actor and Clint Eastwood getting fired from Gunsmoke and Rawhide on the same day, which resulted in Reynolds going off to take acting lessons. Musician Vanilla Ice said that he was feeling "super emotional" and shared a picture of the two together. Baby Driver director Edgar Wright remembered Reynolds for his work as a dramatic actor and director. He says this. "R.I.P. Burt Reynolds, underrated as a dramatic actor (Deliverance), underrated as a director (Sharkey's Machine), but also a rare movie star that seemed to be just having an absolute ball onscreen. Nobody broke frame with a bigger gleam in his eye. Just watch ol' Bandit run." Musician Richard Marx also shared a touching story of running into Burt Reynolds in a video store in the mid-1990s. Marx walked up to the actor to thank him for all of the entertainment that he had created over the years. The musician says that Reynolds greeted him with his giant trademark smile and said, "You made my day. Thank you." Director Kevin Smith also shared some kind words about Reynolds. Smith explained how much the actor meant to him. "As THE movie star of my childhood, the Bandit stole our hearts for decades. I always loved how Burt Reynolds worked with his friends as often as he could and then showcased the fun of movie-making in the end credits of his flicks. He was true a American icon. 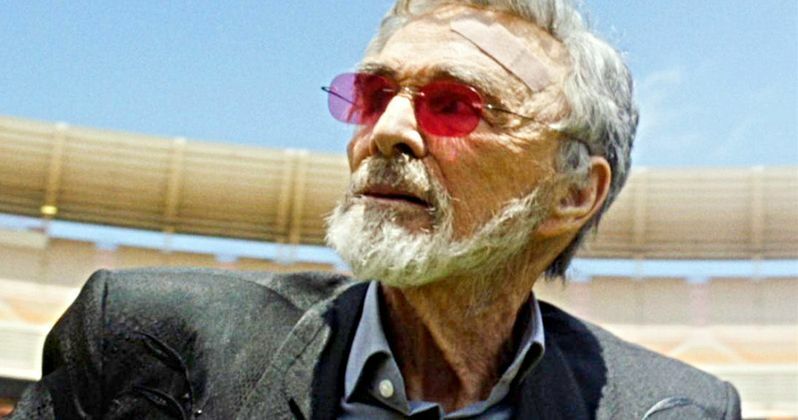 Hate to see him go..."
Burt Reynolds was working on Quentin Tarantino's Once Upon a Time in Hollywood at the time of his death. It's not clear if he had already finished his scenes, or if he was gearing up to go visit the set. Reynolds left a huge mark on Hollywood and he will truly be missed. You can read some of the social media tributes to the actor below, starting with Arnold Schwarzenegger's Twitter tribute. Rest in Peace, Burt Reynolds. The Hollywood Reporter was one of the first to report the death of Burt Reynolds. My only encounter with Burt Reynolds (Mystery, Alaska) was brief but a lot of fun. Shot the breeze about movies, theater, life. Sorry to hear he’s gone. But he’s not.